TOKYO FREE GUIDE offers overseas visitors a free guided tour in and around Tokyo, which has a myriad of exciting and appealing attractions. We will take you to look around at your request, free of charge, including Kamakura, or vicinities of Tokyo. Although our volunteer guides may not speak your language perfectly, we are full of energy with heart-warming hospitality and cultural insights. Our latest information ensures that you will have a memorable experience in and/or around Tokyo. Even if you already live in Japan, all overseas people are welcome. We may know about Tokyo more than you do! If you wish to have a tour with a volunteer guide, book now! We look forward to meeting you in Tokyo soon! You can request a guide up to two months in advance. Please refer to Booking FAQ. Contact Us for guests who required a guide. After REQUEST a GUIDE, if you have some trouble and you want to contact us, click here to send us your message. Please be sure that you received the automatic email titled of “Your User Account was created & Confirmation of Receipt of Your Guide” for new guests or “Confirmation of Receipt of Your Guide Request” for registered guests. If you didn’t, your request may not have been received by TOKYO FREE GUIDE. Please login and check whether your request was properly made. The login button is located in the left side of the Web Page(PC) /under the menu (mobile phone) or click here. After login, you will find a calendar. Please check if you find your name on the calendar of the month you plan to visit. If you don’t find your name, your request was not received by TFG. 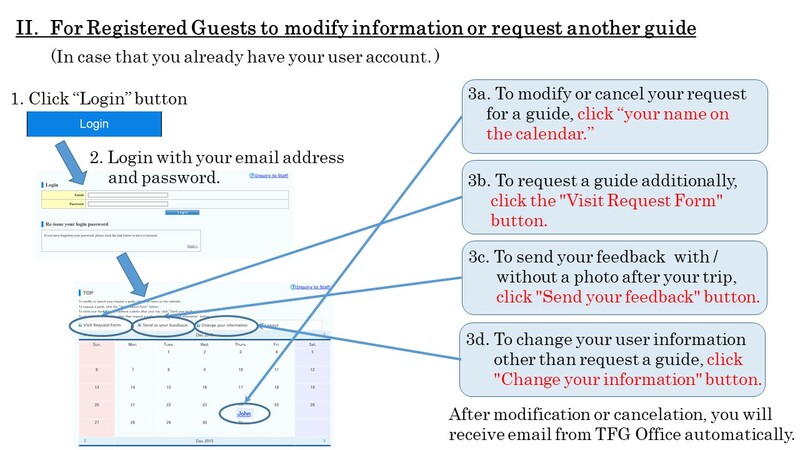 If you want to modify your request form, cancel your request, or change your information, please login. The login button is located in the left side of the Web Page(PC) /under the menu (mobile phone) or click here. Please refer to above “II. Registered Guests to modify information or request another guide” in this page. If you want to request another guide, please login. The login button is located in the left side of the Web Page(PC) /under the menu (mobile phone) or click here. You can send feedback comments with or without photo. This help us to improve our guide service. If you allow we post these comments and photos to our home page or Facebook. Please login. The login button is located in the left side of the Web Page(PC) /under the menu (mobile phone) or click here. Then click “Send us your feedback” button. You may receive our email questionnaire after our guide services. Please take the time to fill it out and send it back to us. This help us to improve our guide service.